As team Fauquier concluded its regular season competing at the USMC Challenge on Saturday, Jan 28th in Stafford, four Falcons earned first place. For Gino and Franco Camarca this was the first time that brothers on a Fauquier wrestling team won an event simultaneously. Two other Falcons Kyle Budd and Ty Foster also ran the table going 4-0 on this day, it was special for Budd as he reaches the 100-win mile stone. Senior and captain Foster sidelined all month finally got back on the mat and showed he can still win as well. “A completely different wrestling team from just a week ago” as Coach Fisher states “glad to see we are finally getting our starters back into the line-up”. Q: It’s great to see Ty Foster back in the line-up and he looked good on Saturday, but can you talk about the season and the injuries that the team has endured? Fisher: "This has been the worst year of injuries that I have ever had. Although injuries are certainly not unique to us, we have seen more than the average and the types have been more than just the standard sprains/strains. For the past 5 weeks, we seemed to lose another starter every weekend without them returning to the lineup. At one point last weekend, we were without 5 of the 14 starters." The USMC Challenge had been cancelled the past few years due to weather condition as the field drew lesser teams for 2017. But the five teams competing in the event on Saturday all having tough competition tested the Falcons at each weight as the team ended in third place. Kyle Budd a team captain as well had been wrestling 126 lb in 2016 has now certify for the 120 lb weight class and looking to make a run at the state finals and the only Falcon returner 4A state champion from a year ago. Kyle Budd earned his 100 win on Saturday in the third round by defeating Josh Montague (Brooke Point) by a Fall in the 2:43 mark. Budd earned a total of three pins at the USMC Challenge but was also was named tournament MVP for the lower weights. Q: As Kyle Budd now rest at 101 wins, any words about Kyle Budd reaching the 100-win mark? Fisher: "That is a tremendous accomplishment in general, but when you consider that he is only a junior and our schedule year after year which is designed to more than challenge even our best guys, his accomplishment becomes truly special". Freshmen Gino Camarca wrestling at the 106 lb all season long for the Falcons and was also able to win his four matches on Saturday achieving three pins along the way. 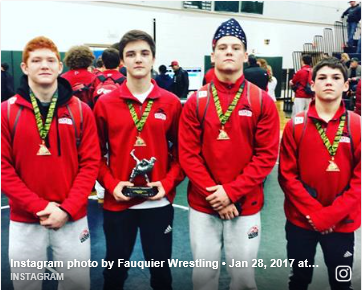 Q: One of the reason one could say that the Fauquier wrestling team has struggled this year could be the youth of the team. Can you tell us something about how the Freshmen class and how they are earning there stripes this season? Fisher: "This team may have been the youngest team that I have ever put on the mats. It was young despite the injuries, and with those, many more freshman were able to find their way into the lineup. Although it is always tough being thrown into the fire before you ready, that experience will help prepare those guys for future greatness that much earlier. Assuming they put in the time in the off-season, I can see ½ the team being sophomores next year, and that would be a recipe for success in multiple years to come". Q: Just three weeks away from the 4A state meet, any words to discuss is the team can three-peat? Fisher: "Well, I think we are in the mix. I’m sure there are few outside of our room that believe that we have a shot. But, many of our previously injured guys are finding their way back into the lineup, and the team started jelling at USMC challenge. We were able to beat some really good teams, and we continue to improve. I am the eternal optimist, and know that if we put it all together, we have a shot…. So in short, I am saying there is a chance". Post Season: As the regular season comes to an end team Fauquier will now gear up for the post season. The Conference is scheduled for Saturday, Feb., 4 at John Champe HS. More details of this event will be posted soon. Participating Teams: Colonial Forge, Fauquier, Lee-Davis, Lake Braddock, Brooke Point.